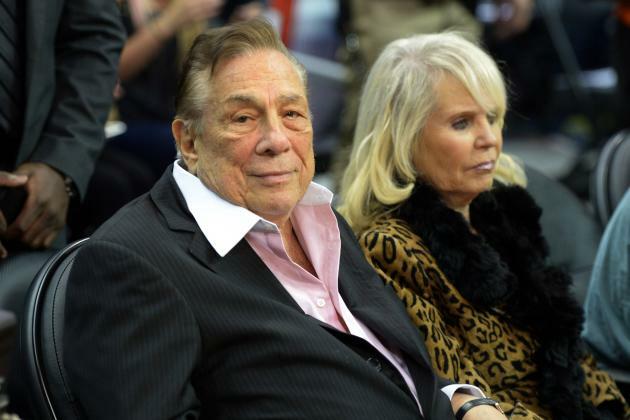 Clippers’ Owner Donald Sterling or is it Donald Tokowitz? Here’s Happy Couple #1 – Los Angeles Clippers’ owner Donald Tokowitz Sterling with his wife Rochelle, the former Rochelle Stein. 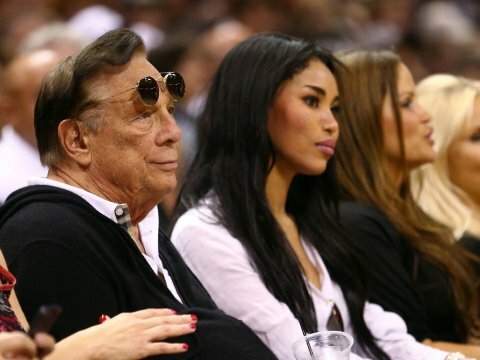 Here’s Happy Couple #2 – Los Angeles Clippers’ owner Donald Tokowitz Sterling with “girlfriend” V. Stiviano, a name that sounds almost Italian. This Tokowitz Sterling character looks like he’s a great time to be around, doesn’t he? Talk about a walking buzz kill. Sterling was born Donald Tokowitz in Chicago. He bought the Los Angeles Clippers, then in San Diego, after getting the idea to buy a team from a business associate Dr. Jerry Buss, who owned the Los Angeles Lakers. He bought the team in 1981 for $12.5 million. The Clippers today are worth close to $600 million and Donald Tokowitz Sterling is worth about $2 billion. That’s why his wife Rochelle puts up with his girlfriend being put on public display and why his girlfriend will sit next to him looking miserable. After you read the next sentence you won’t be able to unread it, so beware. $2 billion also serves as a mental block, of sorts, for girlfriends that are 40 or more years younger than he is when blowing him. Don’t blame me, I warned you. Donald Tokowitz Sterling has owned an NBA team longer than any other owner in the league. At 80, he made his money first as a personal injury lawyer, a racist real estate tycoon and later as the racist owner of the Clippers. Or from the now infamous and alleged audio between Tokowitz Sterling and Stiviano. DS: The white Jews, there’s white Jews and black Jews. Do you understand? VS: And are the black Jews less than the white Jews? DS: A hundred percent. Fifty, a hundred percent. Why bring the black people to the games? I don’t want to change. If my girl can’t do what I want. I don’t want the girl. I’ll find a girl that will do what I want. There’s a lot of hate and self-hatred in this guy. You don’t need to be a shrink to figure this out. He legally changed his name by adding “Sterling” to it. I’m guessing he doesn’t like people looking at his real name “Tokowitz” and immediately thinking, “Jew,” similar to the way he looks at a person of color and immediately thinks they are less human, they smell and are n******. He tells his bought-and-paid-for girlfriend not to bring blacks to Clippers’ games. Yet he brings blacks to Clippers’ games. His girlfriend is half Mexican and half…you guessed it…black. At 80 years old, nothing is going to change the views, opinions and racist thoughts of this guy. It’s time for NBA owners to make a stand for their teams, their players and fans of all races, creeds and religions and silence this guy once and for all by forcing him to sell the team. Sadly, he will profit handsomely, but it will be for the greater good. There was time you didn’t realize this Zionist was Jewish.